Innovation is good. Action on longstanding issues would be even better. 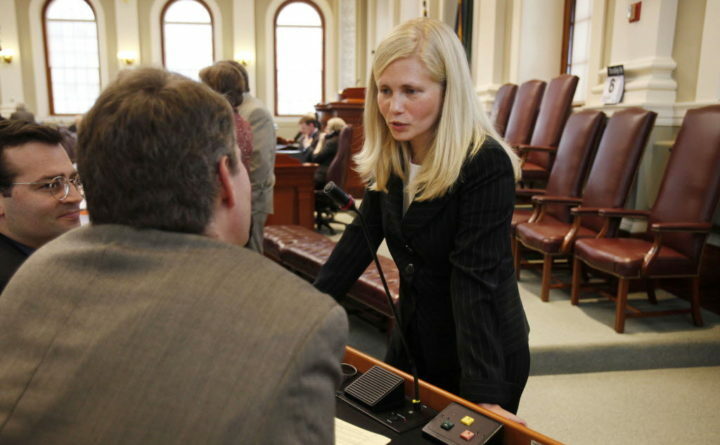 5087628 Caption Then House Speaker Hannah Pingree talks with Democratic lawmakers in the State House in 2010. Innovation is a popular word in Augusta right now. On Thursday, Gov. Janet Mills announced that former Maine Speaker of the House Hannah Pingree will lead a restructured and rebranded version of the Office of Policy and Management under a new name: the Office of Innovation and the Future. In December, Democratic leaders in the Legislature announced that the Labor, Commerce, Research and Economic Development Committee committee is being re-formatted as the Innovation, Development and Economic Advancement and Commerce (IDEA) Committee. Republicans later secured the addition of “Business” in place of “Commerce at the end of that already long name — a worthy and more direct nod to the obvious role that business plays in the committee’s work. Clearly, the unified Democratic power in Augusta is making a rhetorical push to be forward looking. That’s not a bad thing, especially considering how we’ve been mired in some of the same issues and conversations year after year. But the true test will be one of policy, not branding. The change from an office of policy and management to one of innovation is a back-to-the-future move of sorts from the Mills Administration which, if approved by the Legislature, will likely be modeled after the State Planning Office first developed in the 1960s under then-Gov. Ken Curtis. It’s a bit like renaming and reinventing the wheel at the same time, but it does demonstrate a much-needed commitment to long term strategic planning and, importantly, coordination across different departments. That coordination is particularly important on longstanding issues like growing and strengthening the skills within Maine’s workforce, which hasn’t been short on attention or ideas from around the state but feels mired in the same conversations about Maine’s aging population of workers and a mismatch of skills and available jobs. “Meanwhile, a legislative panel was recently told that Maine does not have enough skilled workers to fill jobs that go unfilled in several parts of the state. What’s more, some regions of Maine have chronic unemployment or underemployment that make living precarious and drive younger residents away,” wrote this editorial board — not last year, not five years ago, but in 2007. We can make the same assessment right now. Workforce challenges require action across multiple disciplines including education and economic development, and as such fall within the jurisdiction of several legislative committees and departments. There have been numerous reports and policy proposals suggested, with a dizzying list of partners and stakeholders involved. Yet we are still talking about the same demographic cliff and labor shortage imperatives that we have been for years. From that perspective, working towards a more robust planning arm of the state government could be a good step in the right direction. The administration and Legislature would do well to establish a clear and concise list of workforce priorities. Groups like the Chamber of Commerce, Educate Maine, Maine Development Foundation and others have already leveraged their collective resources and expertise to develop workforce proposals. But the list of ideas is long — and expensive — and this conversation will need coordinated direction rather than jumping, issue by issue, from one department or committee to the next. While it’s not enough to do new things for the sake of doing new things on issues such as workforce development, we need to move the needle after years of the same debates, proposals and, yes, same editorials. An influx of new structure for some of our institutions could be a very good place to start. But the details will matter. The Mills administration and legislative leaders — particularly the Democrats in power — will need to take care to match their innovation rhetoric with action, and to realize that some of the hard work has already been done.